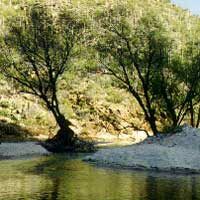 I just read an email from my youngest daughter saying she had her own retreat yesterday — sitting next to a small stream in the Sabino Canyon National Park and reading her Bible and journaling. I’m back to WATER, God. Sitting beside a flowing stream and “being with You” as a chosen action — connecting with You — the Living Water. And I just looked up an my indoor anthurium plant and took it into the tub for several doses of water and had a glass myself. We need water. And I need YOU. 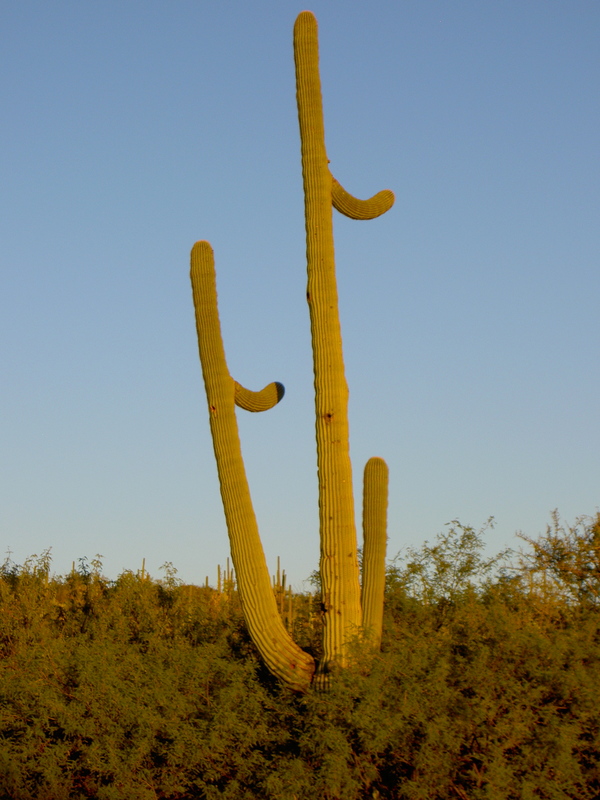 In looking up how to spell saguaro I discovered that they grow slowly (one inch a year) and live to 200. They also have short (3 foot) tap roots. BUT they have smaller roots that extend out the height of the cactus and encircle big rocks to steady themselves in high winds. I like that! I like it that I’m not the only Slow Grower You created! And I loved the idea that they are able to have anchoring roots. We ALL need anchoring roots, God! It’s a Windy World. Now back to sitting by a stream. Water in the Desert is even more appreciated. And somehow streams are more intimate than rivers. I am sitting here thinking about how the Saguaro flowers feed the birds in the Spring and their fruit feed birds and many other creatures in the Fall. I’m pondering the fragile yet durable web of life in the desert. And, I guess, thinking of the sheer numbers of species — how many millions of insect species — and how EVERYTHING is CONNECTED to EVERYTHING ELSE. That can cut both ways — it can make us seem insignificant — or it can invite us into a far deeper meaning than our mind can comprehend. We are INVITED to join into the CHORUS of PRAISE for the GIFT OF LIFE. And to wrap our roots around Your Love! Smile. THANK YOU! ‹ Wake UP, Women of Planet Earth!